The markets today opened on a negative note on the back of weak cues from the global markets. The early sell off witnessed among the Capital Goods, IT and Metal stocks. However, Realty and select auto stocks are gaining momentum today. The broader market indices have outperformed the benchmark index in the early trade as both the BSE Mid Cap and the Small index are trading higher. 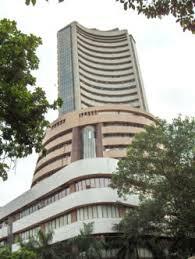 The BSE Sensex is now trading below the 14850 mark and the NSE Nifty below the 4500 mark. The BSE Sensex is trading down by 131.74 points or (0.88%) at 14,826.17 and the NSE Nifty is trading lower by 40.20 points or (0.89%) at 4,477.60. The BSE Mid Cap increased by 21.59 points or (0.41%) to 5,247.75 and the BSE Small Cap grew by 21.14 points or (0.35%) to 6,032.50. The Overall market breadth is positive as 917 stocks are advancing while 729 stocks are declining and the 59 stocks remained unchanged on BSE.